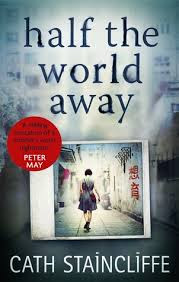 After graduating, photography enthusiast Lori Maddox sets off to do some travelling, she ends up in China where she decides to become a private English teacher. Her parents Tom and Jo follow her adventures through a blog Lori is keeping online. When a few days go by and Lori doesn't update her blog or reply to any e-mails or phone calls from her parents Jo and Tom decide to report her missing to the Manchester police, who involve the Chinese police. After a week of not hearing anything, Jo and Tom decide its time to fly to China to join the search for their daughter. Can they find her in time? This is the second book I have read by Cath Staincliffe now and I must say I am now hooked on her books, I have become one of her biggest fans. This story really tugs at your heartstrings. You really feel for Tom and Jo and you find yourself getting really frustrated with the Chinese police for not doing a very good job and then even more so when Jo and Tom are arrested. I found I didn't like Nick as a character and would have prefered to see Jo and Tom reconcile. I felt Nick was a rather selfish man, only thinking of himself when Jo's daughter is missing in a foreign country. I didn't think he was very supportive at all. Although I did feel sorry for him when Jo and Tom slept together behind his back. I thought Lori was a wonderful character, strong and quirky and in many ways, she reminded me of myself, I found I could relate to her a lot which made for a good read. I really did enjoy this book. I listened to the audiobook and found I was taking every opportunity to listen to it, at bedtime, while doing the housework, in the shower. Whenever I could listen I would. Praise yet again for Cath Staincliffe.